Fashion loves the sockless look; it comes around as a trend pretty regularly in spring/summer trends and it’s here again. While there’s no denying that it looks good with shorts, espadrilles and even casual suits, pull on that pair of boat shoes or slip-on driving shoes and eventually, you have to deal with the consequences – sweaty, sticky feet and even uncomfortable rubbing against bare toes. Pringle Gourock Cotton Shoe Liners let you keep the casual sockless look while step-stepping the side effects. 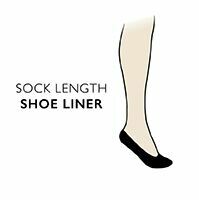 They are ultra low sided, thin cotton rich liners, made with a seamless construction to suit all types of shoe. You get a single multi-striped pair with two plain colour pairs in each triple pack, all with useful silicone anti-slip grips inside the heel to prevent the liners ‘walking’ under through the day.